We invite you to look at our in season discounts. We have a few extra goodies in which we are confident you will "love". This season we want to offer every member a free clinic if you can fill out a survey. More information to come. We are pleased to be moving to a more updated registration process which will make the process much more smoother. We look forward "serving you" once again this season! For our Côte Saint-Luc location at the Caldwell Tennis Courts, we are pleased to have access to Wagar high school during the summer. We won't have to go back and forth to the Aquatic Community Centre (although it is a beautiful location). Bathrooms are now even closer! We will also have access to the gym and cafeteria. This simply means more space! We are also pleased to have hired Sandra Chindalo for our CSL location who currently plays for the Concordia University women's tennis team. Our Verdun location has Herman Koffi avery experienced tennis coach which we know you will be thrilled upon hearing about. Don't Miss the In Season Discount! Did you Say a Free Clinic? Any member who fills out a survey will get a free clinic. We just want to better understand how we can "serve" you better. More details to follow. Take a look at our clinics page which has updated lessons as of now but will have even more during the season. 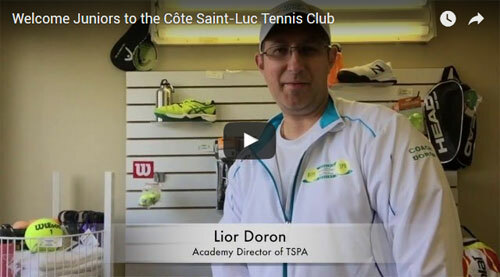 The City of Côte Saint-Luc in partnership with TSPA also offers lessons for kids and adults. See brochure (page 22). Registration for those lessons is done with the City. Register. Get undivided attention from one of our certified pros! You can even choose the one you want! Read about the TSPA Dream Team! Sign up as a Family... and Save Big! When it comes to tennis apparel, gear and accessories, we got you covered from head to toe. Visit store. Not ready to shop online? You can always visit the boutique on the second floor of CSLTC. For the 2018 tennis season, for any new member referred to the Club, the referring member receives a Guest Pass Card for 5 sessions, valued at $50.00.